Singing Hills Kennel - Welcome to the Frontpage! 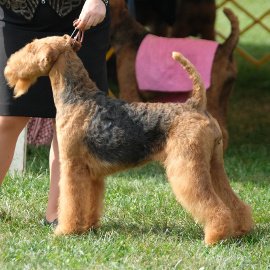 Welcome to Singing Hills Kennel, breeders of high-quality Airedale Terriers. Choosing an Airedale Terrier is one of the best decisions you will ever make. You cannot pick your relatives, but you can make a valuable addition to your family by choosing an Airedale. This unique breed of dog is the "King of the Terriers". They make great family dogs, security dogs, and show dogs. They are intelligent, easy to train, and love to be a part of the family. The dogs we provide have excellent pedigrees and exceptional genetics. That's why families from across the country have trusted Singing Hills Kennel for nearly fifteen years. WHY CHOOSE AN AIREDALE FOR YOUR NEXT PET? The Airedale is not for everyone. They are among the most interesting dogs you will find anywhere. They can be inquisitive and curious to the point that you never know what they are going to be doing. Owning an Airedale is an adventure, sometimes a challenge, but always a delight. They are highly intelligent, easy to train, playful, and really believe they are meant to be at every function your family has. They like to be in the middle of your life! They do not want to be left in the yard alone. They want to be right next to the family, ride in cars, go places, and enjoy a social life. Airedales are loyal and protective, making them the perfect family dog.. The Airedale can also be an option for those who are allergic to dogs. Airedales are hypoallergenic. Feel free to contact us. We will be happy to answer any questions you may have. 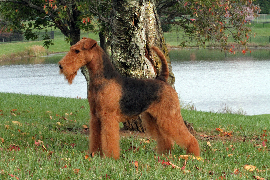 The Airedale is very adept at finding their place in a new home or working into different kinds of social occasions. The Airedales were created in England in an area known as the Valley of the River Aire. Copyright © 2019 Singing Hills Kennel Designed by Martin Media Solutions.